N.B. Mary Jane Haley (daughter of Elisha and his first wife Ann) age 1 is not listed with the family. Mary Jane Haley died on 16 Aug 1875 from typhoid fever after 17 days. Her four children received an annuity from the Haley family - possibly from the Will of their grandfather Elisha Haley who died in 1866. 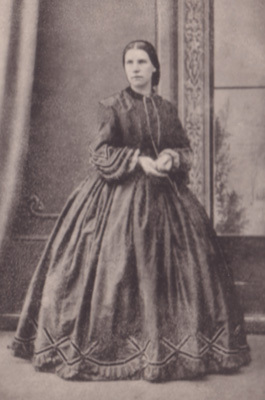 Mary Jane's parents were Elisha Haley (1813-1866) and Ann Deighton-Haley (1817-1840) who died aged 23 only three months after the birth of her only child Mary Jane. Elisha Haley remarried a year later. His second wife was Harriet Noble (??-??) with whom he had another family. 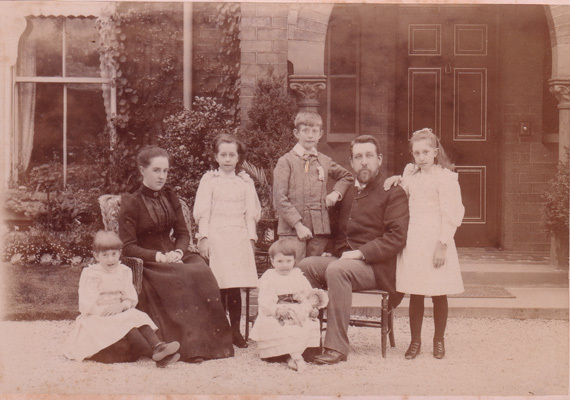 The Haleys lived sometime at Holmfield House, Thornes Park, Wakefield, Yorkshire and a picture of some members of the Haley family is shown below. We are led to believe they are Alfred Haley, son of Elisha Haley, born 1 Sep 1848 in Bradford, his wife Mary Alexander of Newcastle-upon-Tyne, and their children and is probably taken outside Holmefield House. Mary Jane Haley-Murgatroyd was my maternal great grandmother. This information about the Murgatroyd/ Haley Family tree has been collated and published by Malcolm Rigg.